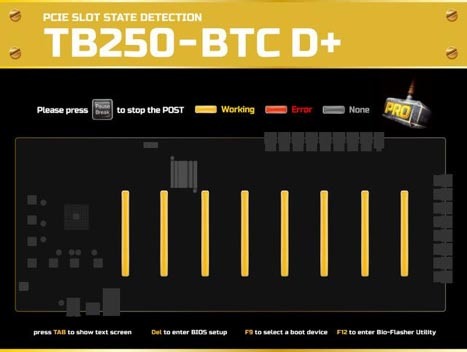 BIOSTAR presents the iMiner Series of complete Crypto mining machines featuring the BIOSTAR TB250-BTC mining motherboard and BIOSTAR mining GPUs. 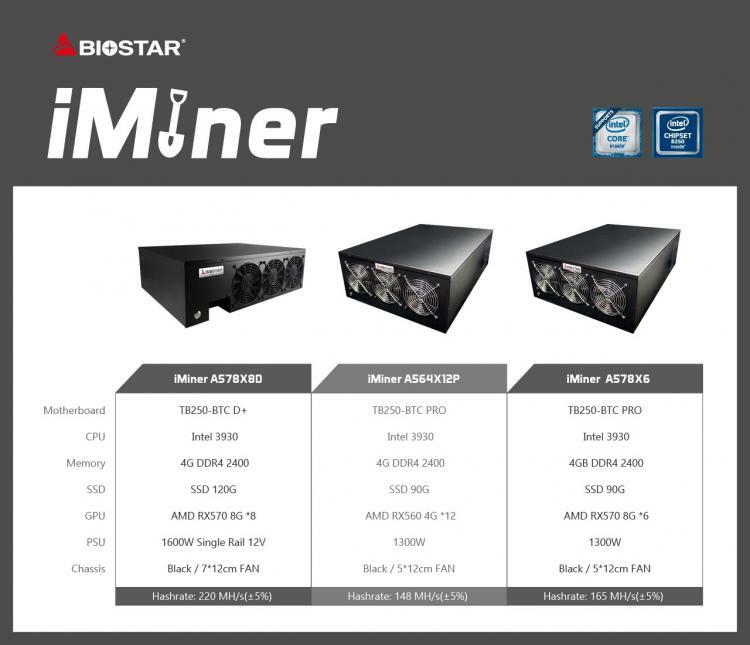 The BIOSTAR iMiner Series Crypto mining solutions are offered in three variants: the iMiner A578X6 with 6 AMD RX 570 GPUs, the iMiner A578X8D with 8 AMD RX 570 GPUs, and the iMiner A564X12P with 12 AMD RX 560 GPUs. The BIOSTAR iMiner series is a single unit all-in-one mining machine complete with its own motherboard, GPU, CPU, memory and power supply offering miners the fastest way to get into mining. The BIOSTAR iMiner systems are powered by the Intel G3930 processor and the Intel B250 chipset. The iMiner series feature mining flexibility with support for different GPU mineable cryptocurrencies including Bitcoin Gold, Monero, Ethereum and Zcash. 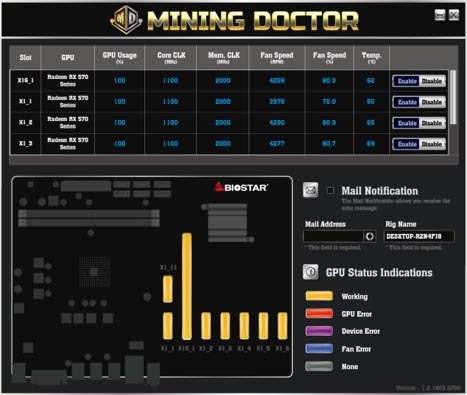 The BIOSTAR iMiner Series features a helpful software that helps miner troubleshoot and determine the state of the mining GPUs before entering into the OS. The BIOS detects PCIe slot state according to their positions and: Working, Error, and None. An exclusive application for BIOSTAR mining systems that monitors the state of the mining system. It monitors the mining GPU’s performance, fan speed and temperature to ensure the overall health of the system.